The Vilas County group helped start its first incubator project about 18 months ago, and recently started a second in Manotowish Waters. Egan says the group provides low-cost office space for new businesses, plus training and marketing advice. About 25 people are expected to visit Vilas County for next week’s meeting. 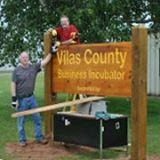 The second Vilas county business incubator gets launched Saturday in Manitowish Waters. A business incubator is established as a location where startups have the chance to setup their new venture with lower costs than if they went about it alone. Nicolet College also helps in mentoring the new businesses.